Skeletal muscle insulin resistance is a primary contributor to the development of metabolic abnormalities and chronic diseases, such as type 2 diabetes. The molecular mechanisms of its pathogenesis remain obscure. Defects in the phosphorylation and dephosphorylation events in the insulin signaling pathway are considered to be one of the main causes of insulin resistance. However, most research on the regulation of these phosphorylation events has been focused on kinases. My research aims to investigate the function and regulation of phosphatases in insulin signaling using approaches of proteomics and molecular biology. Recombinantadenovirus, lentivirus and adeno-associated virus have been constructed to deliver heterologous gene, shRNA and CRISPR-Cas9 into muscle cells and adipocytes to modulate expression levels of phosphatase regulatory and catalytic subunits. To date, two regulatory subunits of protein phosphatase 1 have been characterized in their phosphorlation profiles in response to insulin stimulation. Phosphoproteomics methods have been developed to analyze tyrosine phosphorylation in skeletal muscle, and identified some novel phosphorylation events in insulin signaling regulated by protein phosphatase 1. The long-term goal is to identify novel molecular targets of diabetes for drug development. Michael Caruso, Xiangmin Zhang, Danjun Ma, Zhao Yang, Yue Qi, and Zhengping Yi, "Novel Endogenous, "Insulin Stimulated Akt2 Protein Interaction Partners in L6 Myoblasts", PLoSOne, 2015,10(10):e0140255. 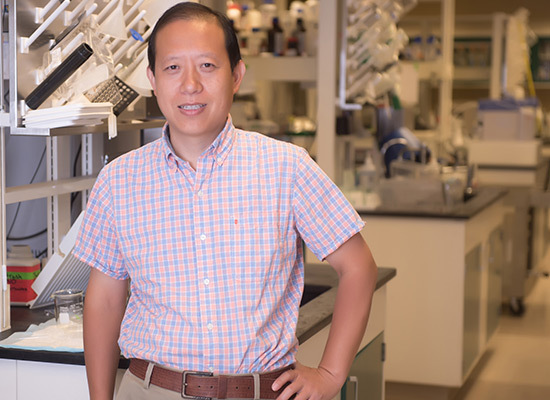 Wei Wang, Yongju Lu, Paul M. Stemmer, Xiangmin Zhang, Yongyi Bi, Zhengping Yi, Fei Chen, "The proteomic investigation reveals interaction of mdig protein with the machinery of DNA double-strand break repair", Oncotarget, 2015, 6(29):28269-81. Xiangmin Zhang and Roy Curtiss III. Efficient Generation of Influenza Virus with a Murine RNA Polymerase I-Driven All-in-One Plasmid. Virology Journal, 2015, 12(1):95. Xiangmin Zhang, Wei Kong, Soo-Young Wanda, Wei Xin, Praveen Alamuri, and Roy Curtiss III. Generation of Influenza Virus from Avian Cells Infected by Bacteria Carrying the Viral Genome. PLOS ONE. 2015, 10(3):e0119041. Wenling Wang, Renqing Li, Yao Deng, Ning Lu, Hong Chen, Xin Meng, Wen Wang, Xiuping Wang, Kexia Yan, Xiangrong Qi, Xiangmin Zhang, Wei Xin, Zhenhua Lu, Xueren Li, Tao Bian, YingyingGao, Wenjie Tan, Li Ruan. Protective efficacy of the conserved NP, PB1, and M1 proteins as immunogens in DNA- and vaccinia virus-based universal influenza A virus vaccines in mice. Clin. Vaccine Immunol. doi:10.1128/CVI.00091-15. Xiangmin Zhang, Danjun Ma, Michael Caruso, Monique Lewis, Yue Qi, Zhengping Yi. Quantitative Phosphoproteomics Reveals Novel Phosphorylation Events in Insulin Signaling Regulated by Protein Phosphatase 1 Regulatory Subunit 12A. J Proteomics, 2014,109C:63-75. Michael Caruso, Danjun Ma, ZaherMsallaty, Monique Lewis, BerhaneSeyoum, Wissam Al-janabi, Michael Diamond, Abdul B. Abou-Samra, Kurt Højlund, Rebecca Tagett, SorinDraghici, Xiangmin Zhang, Jeffrey F. Horowitz, and Zhengping Yi. Increased Interaction with Insulin Receptor Substrate-1, a Novel Abnormality in Insulin Resistance and Type 2 Diabetes. Diabetes, 2014, 63(6):1933-47. Wei Xin, Soo-Young Wanda, Xiangmin Zhang, Javier Santander, Giorgio Scarpellini, Karen Ellis, Praveen Alamuri, and Roy Curtiss III. The Asd(+)-DadB(+) dual-plasmid system offers a novel means to deliver multiple protective antigens by a recombinant attenuated Salmonella vaccine. Infect Immun, 2012, 80(10): 3621–3633. Kimberly Pham, Paul Langlais, Xiangmin Zhang (co-first author), Alex Chao, Morgan Zingsheim and Zhengping Yi. Insulin-stimulated phosphorylation of protein phosphatase 1 regulatory subunit 12B revealed by HPLC-ESI-MS/MS. Proteome Science, 2012, 10(1):52. Xiangmin Zhang, Kurt Højlund, MoulunLuo, Christian Meyer, ThangiahGeetha, Zhengping Yi. Novel tyrosine phosphorylation sites in rat skeletal muscle revealed by phosphopeptide enrichment and HPLC-ESI-MS/MS. Journal of Proteomics, 2012, 75(13): 4017–4026. Alex Chao, Xiangmin Zhang (co-first author), Danjun Ma, Paul Langlais, MoulunLuo, Lawrence J. Mandarino, Morgan Zingsheim, Kimberly Pham, James Dillon, Zhengping Yi. Site-specific phosphorylation of protein phosphatase 1 regulatory subunit 12A stimulated or suppressed by insulin. Journal of Proteomics, 2012, 75(11): 3342–3350. Xiangmin Zhang, Soo-Young Wanda, Karen Brenneman, Wei Kong, Xin Zhang, Kenneth Roland, and Roy Curtiss III. Improving Salmonella vector with rec mutation to stabilize the DNA cargoes. BMC Microbiol, 2011, 11:31. Xiangrong Qi, Xiangmin Zhang (co-first author), Yao Deng, YingyingGao, Roujian Lu, XinMeng, Wenjie Tan, Li Ruan. The non-replicating recombinant vaccinia virus expressing six genes of HIV-1 can be passaged stably in CEF. Bing Du XueBao (Chinese Journal of Virology), 2011, 27(2): 136-143. YingyingGao, Yao Deng, Xiangrong Qi, Xiangmin Zhang, XinMeng, Huijuan Wang, Wenjie Tan, Li Ruan. Expression and immunity of multi-HIV B'/C subype genes in replicating DNA vaccines. Bing Du XueBao (Chinese Journal of Virology), 2010, 26(3): 208-215. Xiangmin Zhang, Wei Kong, Shamaila Ashraf, Roy Curtiss III. A one-plasmid system to generate influenza virus in cultured chicken cells for potential use in influenza vaccine. Journal of Virology, 2009, 83(18): 9296-9303. Chao Li, Yuhua Li, Xiangmin Zhang, Phillip Stafford and Valentin Dinu. ICRPfinder: a fast pattern design algorithm for coding sequences and its application in finding potential restriction enzyme recognition sites. BMC Bioinformatics, 2009, 10:286. Kexia Yan, Wenjie Tan, Huijuan Wang, Yue Wang, Xiangmin Zhang, Yan Li and Li Ruan. SARS-CoV Spike proteins expressed by the vaccinia virus Tiantan strain: secreted SQ protein induces robust neutralization antibody in mice. Viral Immunology, 2009, 22(1): 57-65. Xiangmin Zhang, Shifeng Wang, Wei Xin, Yao Deng, Renqing Li, Kexia Yan, Xiangrong Qi, YingyingGao, Wenjie Tan, Ning Lu, XinMeng, Li Ruan. Effect of codon bias on the gene expression efficiency in vaccinia virus vector. Bing Du XueBao (Chinese Journal of Virology), 2006, 22(5): 350-357. Kexia Yan, Wenjie Tan, Xiangmin Zhang, Huijuan Wang, Linglin Zhang, Weimin Zhou, Ningxia Shao, Li Ruan. Identification of epitopes on SARS-CoVnucleocapsid protein that induce the cross-or specific-reactivity among SARS-CoV, HCoV-OC43 and HCoV-229E. Bing Du XueBao (Chinese Journal of Virology), 2006, 22 (4): 248-255. Xiangrong Qi, Xiangmin Zhang, YingyingGao, Yao Deng, Kexia Yan, Renqing Li, Li Ruan. Expression, purification and antibody preparation of a gene reconstructed HIV-1 Tat protein. Letters in Biotechnology, 2006, 17 (2): 142-145. Renqing Li, Ning Lu, Yao Deng; Wenling Wang, Wei Xin, Xiangmin Zhang, Li Ruan. Cross protective immunity against influenza A virus between subtypes induced by influenza polymerase protein PB1 in mice. Chinese Journal of Microbiology and Immunology, 2006, 4: 322-327. Xiangmin Zhang, Wei Xin, Shifeng Wang, Renqing Li, Roujian Lu, Wenling Wang, YichenLv, Li Ruan. Optimizing the codon usage of HIV-1 gag gene according to the codon bias of vaccinia virus improves the gag gene expression. Bing Du XueBao (Chinese Journal of Virology), 2005, 21(3): 210-216. Wenling Wang, Zhenhua Lu, Wei Xin, Renqing Li, Xiangmin Zhang, Yao Deng, Roujian Lu, Guodong Liang, Li Ruan. Non-replicating vaccinia recombinant expressed antigens of Japanese encephalitis virus can induce protective immunity in mice. Bing Du XueBao (Chinese Journal of Virology), 2005, 21(5): 370-374. Wei Xin, FeiGuo, Roujian Lu, Shifeng Wang, Yao Deng, Wenling Wang, Xiangmin Zhang, Renqing Li, YichenLv, Li Ruan. The expression of nef gene of HIV-1 subtype C Botswana in non-replicative vaccinia virus and its immune effect in mice. Bing Du XueBao (Chinese Journal of Virology), 2004,20(2): 97-103. Ming Xu, Bingci Liu, Xiangmin Zhang, Xianglin Shi, Peng He, Baorong You, Ning Kang. The role of telomerase in chrysotile induced malignant transformation of normal human embryonic lung fibroblasts. Chinese Journal of Preventive Medicine, 2004,38(3): 167-171. Kexia Yan, Bingci Liu, Xianglin Shi, Xiangmin Zhang, Baorong You, Ming Xu, Ning Kang. The role of CDK4 in the carcinogenesis induced by silica. Chinese Journal of Industrial Hygiene and Occupational Diseases, 2004, 22(5): 331-335. Bingci Liu, Peng He, Xianglin Shi, Baorong You, Ming Xu, Xiangmin Zhang, Ning Kang. The role of telomerase in silica induced human cell transformation. Journal of Hygiene Research, 2004, 33(4): 393-397. Xiangmin Zhang, Peng He. Telomere, telomerase and cancinogenesis. Foreign Medical Sciences, Section Hygiene. 2002, 29(4): 211-214.